It's a small world that has made an incredible impact on so many people. It's the hobby that crosses the boundaries of generations. All over the world, there are basements, back-yards and buildings where enthusiastic hobbyists take on the challenge of recreating "The Big Iron" that has amazed young and old everywhere. then these shows are for you! Our shows are more than just a Model Train enthusiast's paradise, they are the ideal family outing where you can marvel at these detailed treasures, perhaps find a piece for display on the fireplace mantel or even get excited enough to start getting involved in this wonderful hobby. Yes, it's something the entire family can enjoy! 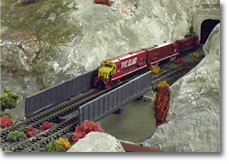 • Railroad memorabilia and all the hobby supplies that you may require. As always, too much to list it all! PLUS, there are often several operating layouts running all day long. use the menu on the left of this page and click on the Show Titles.